Why Go With Carton Flow? Streamlining product flow is an ongoing challenge in most fulfillment facilities. It’s more than simply having the right product on hand to fill orders, although that is certainly an overriding goal. Product flow affects inventory availability and accessibility, product rotation, replenishment and storage processes, travel time, handling and ergonomics, and picking speed and accuracy. For fulfillment operations that handle large volumes of fast-moving inventory consisting of a wide variety of SKUs, the proven turnaround solution is a well-designed carton flow rack system. Why carton flow? In today’s e-commerce environment, distributors are less likely to be handling full pallets; instead inventory is moved to the pick area in individual cartons, where pickers pull items to fulfill the more typical smaller, multi-SKU order. In this type of application, using carton flow racks can increase operational efficiency by as much as 75%, often immediately. How? Carton flow rack systems are shelving units consisting of multiple levels of pitched tracks, complete with either wheel beds or rollers. Cartons are loaded from the rear at the apex of the rack, where gravity propels the carton forward on the rollers toward the picker, in the same sequence in which it was loaded. If there is already a carton in the queue, the newly added carton simply falls in line until it is needed. 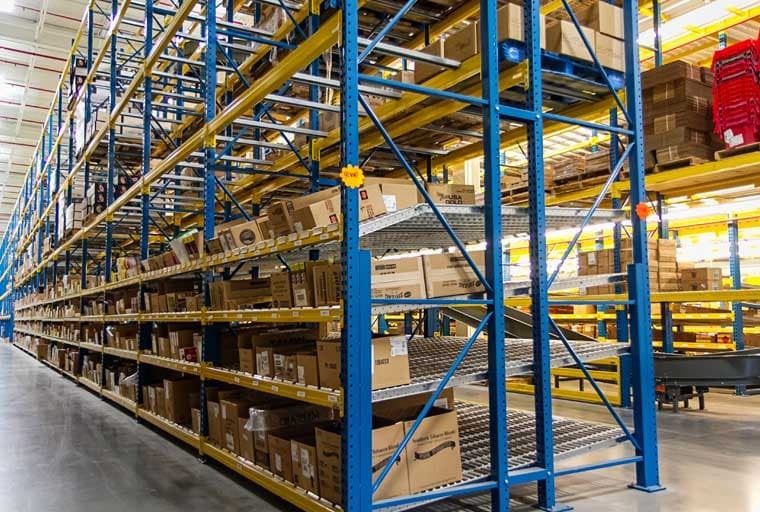 This first-in/first-out (FIFO) design not only ensures efficient inventory rotation, but also allows picking and replenishing operations to take place simultaneously from opposite sides of the rack. Ongoing replenishment means the correct carton always on hand, within reach and in clear view. Freed from the need to wait or travel, workers are able to pick more quickly, accurately and efficiently. For optimized turnaround, carton flow rack systems are the tool of choice. At the same time, it’s important to choose the best carton flow system for your distinct application and product mix. A robust carton flow rack system will minimize product hang-up, which can result in operational delays, damaged inventory, risk to workers and costly maintenance issues. Matching the carton flow system’s size and capabilities to your operational needs is important to achieving optimum space utilization and pick productivity. The best systems are modular, portable, adjustable, customizable, attractive and guaranteed by warranty. Your ideal solution will provide flexibility, durability and smooth product flow. We predict you’ll see a dramatic turnabout. UNEX Manufacturing offers a variety of carton flow systems designed to suit your warehouse application. For example, UNEX Shelf Track is a line of carton flow shelving solutions specifically designed to bring all these benefits to your operation by retrofitting into your existing carton flow shelving. For all your flow needs, contact your UNEX Pickologist today.